When the train arrived at Portsmouth Harbour Station yesterday afternoon, it was greeted by a number of police with high visibility jackets, equipment pouches and sniffer dogs. Thankfully, they were on duty to supervise revellers travelling to the Isle of Wight pop festival (or whatever it is called now - it is 40 years since my sister went to it.) 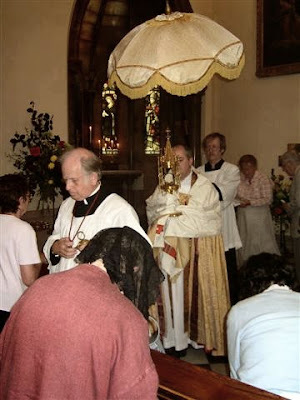 I was a little worried that perhaps they had been tipped off by the Temple Guard that there was to be a celebration of Mass that did not involve facing the people and praying in the vernacular. 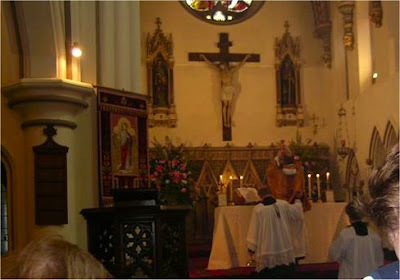 There was a good attendance for the Corpus Christi Mass at St Mary's, Ryde. It was a Missa Cantata - I only realised this just before Mass so I hope that I managed the epistle and gospel tones reasonably. After Mass, there was a procession of the Blessed Sacrament inside the Church to the Sacred Heart Altar where Benediction was given. In the evening, many of the Latin Mass Society members gathered at the Crab and Lobster in Bembridge for a meal with a view over the English Channel. The Society is thriving on the Island and it was good to catch up with their news. Peter Clark has written a number of excellent articles and pamphlets on the Catholic history of the Island. This morning, I celebrated the daily sung Mass (Latin, Novus Ordo) at St Cecilia's Abbey. It was inspiring to see the sisters in choir, and to hear them singing Gregorian Chant so perfectly. After Mass, I had a chance to see an old friend who is member of the community in the parlour afterwards and have a chat through the grille. As ever, I was not let off without some grilling over questions of theology.